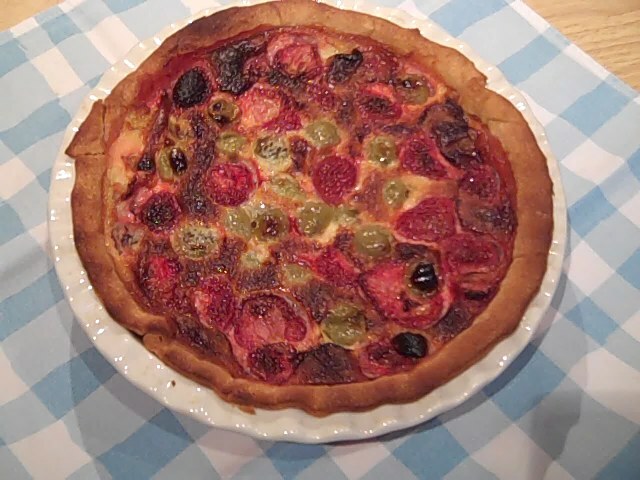 A shortcrust pastry base filled with wobbly custard, dotted with seasonal fruit. Roll out the pastry on a lightly floured surface until large enough to line a 23cm tart tin. Trim the excess pastry from around the edge, then line the pastry case with baking parchment, fill with baking beans and chill for 30 mins. Heat oven to 200C/gas 6. Bake the pastry case for 15 mins, then carefully lift out the parchment and beans, and bake for 5 mins more or until biscuity. Meanwhile, beat the eggs, cream, sugar and vanilla together, then strain into a jug. Sprinkle the semolina or ground almonds onto the pastry base. Scatter the gooseberries and strawberries into the pastry case, then pour in the vanilla custard mixture. Bake for 40-55 mins until the custard is set and the gooseberries are tender. Cool a little before serving, or cool completely and eat cold.